Register Log In ECN Forum Forums Non-US Electrical Systems & Trades American NEMA 10-20R and Australia 20A 3 pin same? 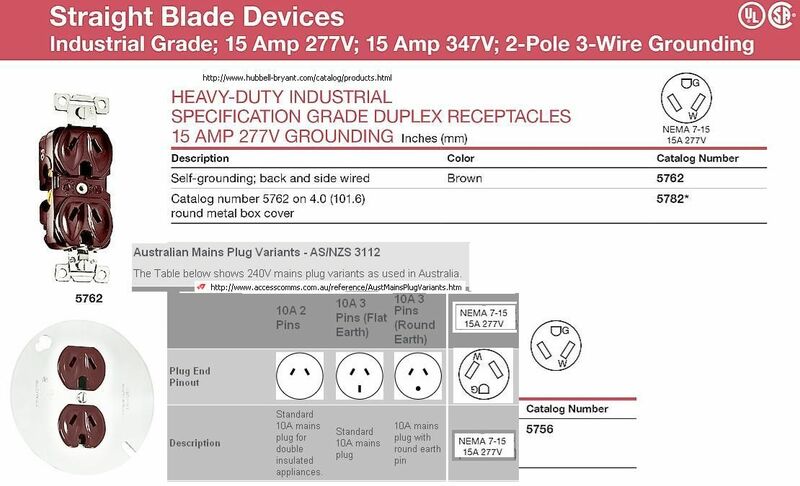 While web surfing, noticed a similarity between the American NEMA 10-20R outlet Hubbell catalog, page A33 and the Australian 20A 3 pin flat earth outlet Australian Mains plugs varients . Wondering if these are in fact compatible, physically and as the American one is intended to provide 240VAC@20A 60Hz, almost electrically, difference being both non-ground pins are hot, vs hot and neutral for the Australian outlet. And 50 vs 60Hz. On the face of it, it looks like the angle of the apertures on the Hubbell device are different to that of our plugs. Having said that, I suppose if you had a big enough hammer, you could make the two instantly compatible. Definitely food for thought, though. But be careful if you come to America and happen to find a 7-15R, don't use it, as it will give you 277V! A funny thing about the AS/NZ plug with the round earth pin. They were originally designed for dedicated circuits, like computers and so forth (to prevent things like heaters and vacuum cleaners being plugged into them). So far, I've never ever seen one installed in any commercial building yet. I have however been to a few offices where a heater or a vacuum cleaner has tripped a breaker, taking down a server. That's what a UPS is for... To keep you up during minor "disruptions". They are compatible here in the shipyard I work in these plugs are used for the lighting. When I worked in port Hedland WA back in the 70's these plug/sockets were in use in one of the laboratories. Round the mining site special 110v plugs were used that had round active pins (2 of them 55v each leg) and a flat earth. Problem was the switches were single pole so you always had 55v even when off. Believe it or not it was possible to force a 240v plug into a 110v trailing socket. Useful if you had to take the oscilloscope out on site. Just had to make sure the voltage selector was put back to 240V afterwards. Problem was the switches were single pole so you always had 55v even when off. I was under the impression that any centre-tapped supply, had to have fusing and switching in BOTH live conductors. The two-pole switching is required and the circuit breakers must have coupled handle and tripping so both go off due to a fault on either conductor, auxiliary trip, or manual action. FYI, I did verify that the rear rocker switch on computer power supplies does have two poles, on at least the ones I checked. So in the USA that would allow them to be connected with NEMA 6-15 to 240 volts safely. This would also apply to "technical power 120 volts" as described in NEC 647. I once saw an old metal-clad Nema angled blade plug in a hardware store. The owner even gave it to me. I also had a switched single AU/NZ socket. The NEMA plug fit it perfectly. Both are gone now,but I can say that is the case. What rating that old NEMA plug was,I forgot,but it did fit.